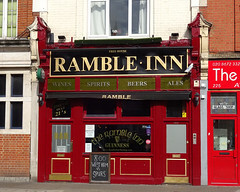 Irish pub in Tooting between Tooting Station and Tooting Broadway station, in an area known as Amen Corner. secretlondon visited one Friday evening in July 2016. There are no handpumps but 10+ keg taps. There is a beer garden. It was friendly and regulars came up to our group and joined in. According to their website they have traditional Irish music every Sunday, a pub quiz every Thursday and poker on Tuesdays. Accessibility: There is an accessible toilet. Last visited by secretlondon July 2016. Opening hours taken from the Ramble Inn website, July 2016. Last edited 2017-05-10 18:37:22 (version 7; diff). List all versions. Page last edited 2017-05-10 18:37:22 (version 7).